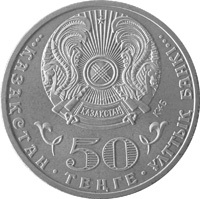 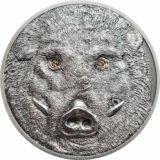 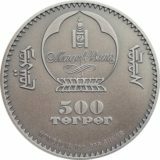 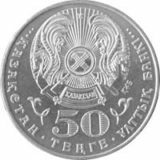 Obverse: at the top is the emblem of the Republic of Kazakhstan: on the right of the emblem is the abbreviation “NBK”; at the bottom inscription “50 TENGE” indicates the denomination of the coin. 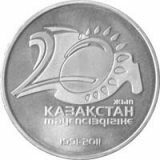 Left and right to the nominal are elements of national ornament; inscription “NATIONAL BANK OF KAZAKHSTAN” in the state language. 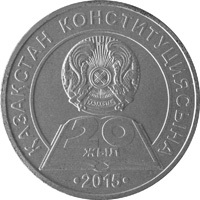 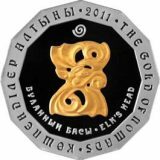 Reverse: an image of the 20th anniversary of the Constitution of Kazakhstan emblem; the number “2015” indicates the year of coinage.